We are also dealing in table fan stamping for different sizes. We offer a quality array of Table Fan Stampings which is made from the premium quality raw material and advanced technology. These Table Fan Stampings can be availed in a range of sizes and specifications as per the demands of clients. These products are offered at market leading price range. 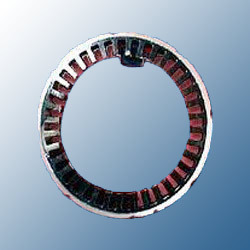 We offer Table Fan Motor Stampings. These are engineered using High Precision components to ensure tough usage and durability. 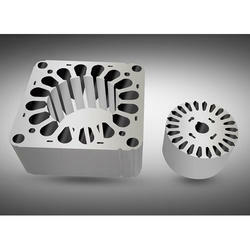 Following the requirement of clients, we offer these products at High Accuracy, specifications and Precise dimensions. We have founded ourselves as a recognized manufacturer of Table Fan Stamping. We have developed Domestic Fan stampings for applications in Domestic pedestral fans, Table Fans and Exaust fans. Stators are provided in Rivetted/Tig Welded form to required stack height and Rotors are Pressure Die casted. We offer a high-quality Auto-Stitched & Auto-Skewed Motor Stamping for Table Fans. These table fan Stamping are uniquely designed with the help of cutting-edge technology including high-speed stamping lines and ultra precise carbide advanced tools. - It is also used in madhani. - It has 8 poles. Magcore Lamination India Pvt. Ltd.